Today Earslfield is largely a late nineteenth-century south-west London suburb, although the area has an interesting history dating back much further, and which I have discussed in my article ‘On the Wandle‘. The church of St Andrew, Earlsfield, was built in two stages between 1888 and 1902. Its two-acre site was given by Magdalen College Oxford, then rapidly developing large tracts of its land in the area. Despite the elite landlord the population of the area was then charecterised as “Very poor working class, hawkers and coster-mongers, with a proportion of artisans, railway servants, and a considerable number of people whose incomes are only sufficient for their own necessities”. St Andrew Earlsfield, London UK; site plan c. 2016. The architect for the new church was Edward William Mountford (1855–1908), who undertook a number of church-building commissions in his early career. But he is perhaps best remebered for designing major civic buildings, such as the Sheffield Town Hall (1890) and London’s Central Criminal Court, ‘the Old Bailey’ (1902). New Sessions House, ‘Old Bailey’, London (1906), architect E.W. Mountford. Sheffield Town Hall (1897), architect E.W. Mountford. The buidling is about to be commenced upon a site presetned by Magdalen College [Oxford], close to Earlsfield Station upon the L. &. S. W. Railway, where a new district has recently been formed, with a population of some thousands, mostly of the working classes. The church is necessarily very plain, funds being exceedingly limited. The walls are of brick, faced principally with red: the roofs, covered with Brosely tiles, are internally of tie-beam construction, coiled at the collar. The stone is Doulting, the floor of woood blocks. On plan, the church consists of nave, 91 ft. by 30 ft., with side aisles and transepts, the chancel being 40ft. by 25 ft., also with north and south aisles, the latter forming [a] side chapel. Seating accomodation for 780 is provided. The choir vestry is large, and will be used as a parish room. The cost will not exceed 6,500l. The architect is Mr. E. W. Mountford. St Andrew Earlsfield, c.1900; view along Garratt Lane looking towards Earlsfield Station. Source: Wandsworth Libraries and Archives. St Andrew, Earlsfield, London, UK. West front, detail. St Andrew Earlsfield, London UK, south side looking west, 2016. — Chancel steps – white marble and pavement marble. — Chancel arcade of brick on square stone piers with shafts at the angles, that to west partly in red brick, some with figure or grotesque stops, one said to be the Architect. — Chancel floor – Rouge Royal and Black from Belgian Quarries. — Chancel screen, in slender wrought iron, set on brick plinth, installed 1920’s from church of St. Mary, Trinity Road. St Andrew’s church, Earlsfiled, London UK. Clock. St Andrew Earlsfield, looking east, c 2016. Source ‘https://londonchurchbuildings.coms&#8217;, accessed 6/8/17. — Clock. The large external clock overhanging the west front in an iron frame with filigree decoration, is to Mountford’s design and was installed in 1911: “To the glory of God and in loving memory of his late Majesty King Edward VII. The clock on this church was erected by the residents of Earlsfield, 8th February 1911.” The clock – iluminated at night – is now maintained by the local authority; its chimes have been disconnected. — Font, resited in south transept, terracotta with blue stone shafts, Doulton & Co., by G. Tinworth, with counterbalanced oak lid. Octagonal, with four scenes depicting Finding of Moses, Hannah bringing Samuel to Eli, The Saviour in the Manger and The Saviour blessing little children. — Glass; windows depict British saints, east window by Heaton, Butler and Bayne. — Lectern, freestanding in brass, made by Starke Gardner & Co. designed by Mountford. — Nave arcade in five bays, deep red brick arches on stone drum piers. St Andrew Earlsfield, the font, c 2016. Source ‘https://londonchurchbuildings.coms&#8217;, accessed 6/8/17. St Andrew Earlsfield, eample of nave light fittings, c 2016. Source ‘https://londonchurchbuildings.coms&#8217;, accessed 6/8/17. St Andrew’s church Earlsfield, London UK, north aisle screen, as in 2017. — North screen, timber, installed 1935. — Pendant light fittings, that over pulpit not modified. — Pews, moveable oak benches, those from western two bays removed. — Pulpit, a low octagonal stone drum with pierced oak upper tier reached by stone steps. — Reredos, behind curtain, a painted triptych of the Transfiguration and flanking angels. St Andrew Earlsfield, south aisle looking east, chapel screen, c 2016. Source ‘https://londonchurchbuildings.coms&#8217;, accessed 6/8/17. St Andrew Earlsfield, chancel, sedilla and piscina, c 2016. Source ‘https://londonchurchbuildings.coms&#8217;, accessed 6/8/17. St Andrew Earlsfield, south aisle looking east, chapel, c 2016. Source ‘https://londonchurchbuildings.coms&#8217;, accessed 6/8/17. — Sedilia in two bays with attached piscina and aumbry under cusped stone arches with dragon stops. — South aisle window by M.Travers. — South chapel; east window in form of St.Andrew’s cross depicitng head of the saint, set in stone rose with small circular lights, under cusped stone arch. — Vestry retains simple fireplace, choir vestry lined with cupboards, doors and cupboards with reeded architraves. St Andrew Earlsfield, London, UK; the chancel, 2017. St Andrew Earlsfield, London UK, the organ (1921) by Harrison & Harrison of Durham, UK; seen from the chancel, 2017. St Andrew Earlsfield, London UK, the organ (1921) by Harrison & Harrison of Durham, UK, 2017. The present pipe organ is by Harrison and Harrison of Durham and was installed in 1921. It replaced an existing organ that was ‘on hire’, but from whom is not currently known. The history of the instrument can be traced in parish records to be found in the London Metropolitan Archive. St Andrew Earlsfield, London UK, the organ (1921) by Harrison & Harrison of Durham, UK; builder’s plate. St Andrew Earlsfield, London UK, the organ (1921) by Harrison & Harrison of Durham, UK. Watkins and Watson on/off switch at the console, for the blowing machjinery, as in 2017. St Andrew Earlsfield, London UK, the organ (1921) by Harrison & Harrison of Durham, UK. peadl board, as in 2017. Indeed, the builder’s specification of 3 June 1919 describes a large three-manual organ, but by 6 September 1919 the specification was already savagely trimmed to just nine stops, with the rest of the instrument being left ‘prepared for’, at a lower cost of £1200, plus £125 for biowing plant by Watkins and Watson (previously agreed, 30 May 1919). This in total is the £1325 referred to in the faculty document. This suggests that either the Carnegie money was not forthcoming or it was used for other things. Possibly it was used to meet the separate (and unforeseen?) costs of having to”remove the present Organ” and having “to erect a Power house upon part of the Vicarage garden, connected by a Wind trunk to the organ through the Church wall.” (LMA DS/F/1921/10/3). St Andrew Earlsfield, London UK, the organ (1921) by Harrison & Harrison of Durham, UK. Console, right-hand side in 2017. St Andrew Earlsfield, London UK, the organ (1921) by Harrison & Harrison of Durham, UK. Console, left-hand side in 2017. Presently, the organ is well maintained, and the nine stops that exist are most attractive in sound. In such a woefully incomplete state many would think that this instrument is barely suited even to the most basic hymn accompaniment. And yet for nearly 100 years the parish liturgy seems to have carried on quite happily with the organ arranged just as it is. ‘Earlsfield: St Andrew‘, Find A Church: Diocese of Southwark. Online resource, accessed 12 July 2017. ‘Edward William Mountford‘, Wikipedia. Online resource, accessed 12 July 2017. ‘St Andrew, 571 Garratt Lane‘, National Pipe Organ Register. Online resource, accessed 12 jluly 2017. ‘St Andrew, Garratt Lane, Earlsfield’, London Churches in Photographs. Online resource accessed 6 August 2017. 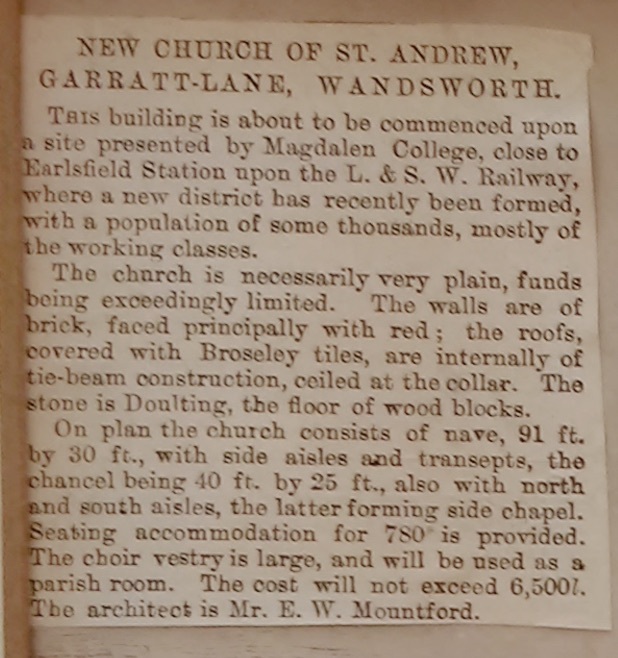 ‘St Andrew, Earlsfield: Garratt Lane, Wandsworth. ‘P95/AND1’, London Metropolitan Archive. [Records deposited by the Vicar in the London County Record Office, 27 February 1957. Further records deposited by the Vicar in the Greater London Record Office, 9 July 1987. Acc/2472 Ac/57/012].